[vc_row][vc_column width=”1/1″][vc_column_text]When Emilie Miller tragically broke her neck in a swimming training accident in January 2008 her world changed forever. For many youngsters in her position it could have been the beginning of the end. However, few people could have envisaged Emilie’s determination and fighting spirit to continue pursuing her love of competition in the pool despite her situation. John took great pleasure in taking Emilie out to lunch before presenting her with a cheque for $10,000 to enable her to chase her dreams of becoming a Paralympian. Emilie, 15, said it was amazing to spend time with John Maclean. The money was made available after Bathurst Wallabies Triathlon Club members, Terry Roberts and Brian Wood, got together to raise funds for Emilie through the JMF. They teamed up to represent the JMF at the 2009 Ironman Western Australia, a gruelling endurance event which includes a 3.8km swim, 180km bike leg before a marathon 42.2km run. Roberts also wore the JMF colours at the World Ironman Triathlon Championship in Hawaii in the same year. 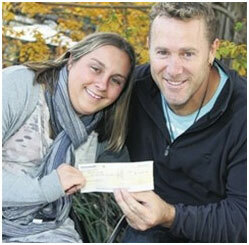 For John Maclean, spending time with Emilie gave him a chance to further fuel her aspirations. “Emilie’s story fits in exactly what the foundation is all about,” he said. “We want to change the lives of young Australians who use wheelchairs. Our mission is to inspire, motivate and enable these great kids to chase their dreams. “Terry and Brian recognised that Emilie has something special and asked that we dedicate their fundraising efforts towards her cause.